Detailed images from Hubble's Near Infrared Camera and Multi-Object Spectrometer (NICMOS) reveal an infant galaxy, dubbed A1689-zD1, undergoing a firestorm of star birth as it comes out of the dark ages, a time shortly after the Big Bang, but before the first stars completed the reheating of the cold, dark Universe. Images from NASA's Spitzer Space Telescope's Infrared Array Camera provided strong additional evidence that it was a young star-forming galaxy in the dark ages. "We certainly were surprised to find such a bright young galaxy 13 billion years in the past", said astronomer Garth Illingworth of the University of California, Santa Cruz, USA and a member of the research team. "This is the most detailed look to date at an object so far back in time." According to the authors, the measurements are "highly reliable'. "This object is the strongest candidate for the most distant galaxy so far", states team member Piero Rosati from ESO, Germany. "The Hubble images yield insight into the galaxy's structure that we cannot get with any other telescope," added astronomer Rychard Bouwens of the University of California, Santa Cruz, one of the co-discoverers of this galaxy. The new images should offer insights into the formative years of galaxy birth and evolution and yield information on the types of objects that may have contributed to ending the dark ages. During its lifetime the Hubble telescope has peered ever farther back in time, viewing galaxies at successively younger stages of evolution. These snapshots have helped astronomers create a scrapbook of galaxies from infancy to adulthood. The new Hubble and Spitzer images of A1689-zD1 show a time when galaxies were in their infancy. Current theory holds that the dark ages began about 400,000 years after the Big Bang, as matter in the expanding Universe cooled and formed clouds of cold hydrogen. These cold clouds pervaded the Universe like a thick fog. At some point during this era, stars and galaxies started to form. Their collective light heated and cleared the fog of cold hydrogen, and ended the dark ages about a billion years after the Big Bang. "This galaxy presumably is one of the many galaxies that helped end the dark ages", said astronomer Larry Bradley of Johns Hopkins University in Baltimore, USA, and leader of the study. "Astronomers are fairly certain that high-energy objects such as quasars did not provide enough energy to end the dark ages of the Universe. But many young star-forming galaxies may have produced enough energy to end it." The galaxy is so far away it did not appear in visible light images taken with Hubble's Advanced Camera for Surveys, because its light is stretched to infrared wavelengths by the Universe's expansion. It took Hubble's NICMOS, Spitzer and a trick of nature called gravitational lensing to see the faraway galaxy. The astronomers used a relatively nearby massive cluster of galaxies known as Abell 1689, roughly 2.2 billion light-years away, to magnify the light from the more distant galaxy directly behind it. This natural telescope is a gravitational lens. Abell 1689 is one of the most spectacular gravitational telescopes known and its gravitational properties are very well known. Though the diffuse light of the faraway object is nearly impossible to see, gravitational lensing has increased its brightness by nearly 10 times, making it bright enough for Hubble and Spitzer to detect. 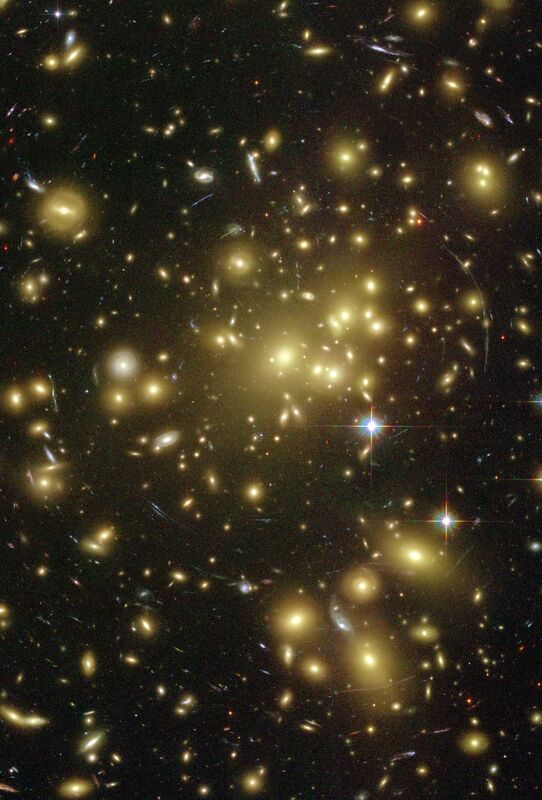 A telltale sign of the lensing is the smearing of the images of galaxies behind Abell 1689 into arcs by the gravitational warping of space by the intervening galaxy cluster. Piero Rosati says: "This galaxy lies near the region where the galaxy cluster produces the highest magnification -- which was essential to bring this galaxy within reach of Hubble and Spitzer." Spitzer's images show that the galaxy's mass is typical of galaxies in the early Universe. Its mass is equivalent to several billions of stars like our Sun, or just a tiny fraction of the mass of the Milky Way. "This observation confirms previous Hubble studies that star birth happens in very tiny regions compared with the size of the final galaxy", Illingworth said. The faraway galaxy also is an ideal target for Hubble's successor, the James Webb Space Telescope (JWST), scheduled to launch in 2013. Even with the increased magnification from the gravitational lens, Hubble's sharp "eye" can only see knots of the brightest, heftiest stars in the galaxy. 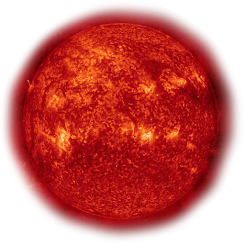 The telescope cannot pinpoint fainter, lower-mass stars, individual stars, or the material surrounding the star-birth region. To see those things, astronomers will need the infrared capabilities of JWST currently being developed by NASA, ESA and CSA in a major international collaboration. The planned infrared observatory will have a mirror about seven times the area of Hubble's primary mirror and will collect more light from faint galaxies. JWST also will be able to view even more remote galaxies whose light has been stretched deep into infrared wavelengths that are out of the reach of NICMOS. "This galaxy will certainly be one of the first objects that will be observed by JWST", said team member Holland Ford of Johns Hopkins University. "This galaxy is so bright that JWST will see its detailed structure. This object is a pathfinder for JWST for deciphering what is happening in young galaxies." The astronomers noted that the faraway galaxy also would be an ideal target for the ESO/NRAO/NAOJ Atacama Large Millimeter Array (ALMA), which, when completed in 2012, will be the most powerful radio telescope in the world. "ALMA and JWST working together would be an ideal combination to really understand this galaxy", Illingworth said, noting that: "JWST's images and ALMA's measurement of the gas motions will provide revolutionary insights into the very youngest galaxies." The astronomers will conduct follow-up observations with infrared spectroscopy to confirm the galaxy's distance using ESO's VLT and the Keck telescope atop Mauna Kea in Hawaii.